THE GLOSS GUIDE: Pamper Yourself! 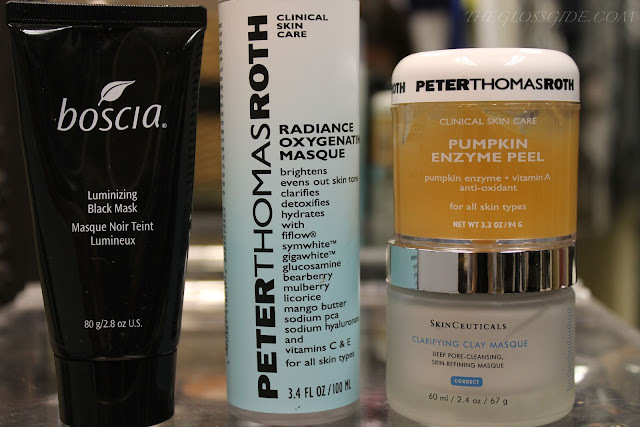 Peels, Masks, and Pumpkins - Oh My! These are my all time favorite face treatments to use at home. On those days where I just need to pamper myself - these do just the trick! And trust me....I've tried many a mask!! Boscia Luminizing Black Mask- If your skin is feeling a bit congested - this is just the ticket! It feels almost like glue when you apply it, not to mention it truly is black! You may look a bit scary! Once it dries you peel it off, along with dirt, oil, dead skin, and grossness. Aaaah now your skin can breathe! You're Welcome! SkinCeuticals Clarifying Clay Masque- When my skin is feeling super oily and broken out, nothing works like this! It really gets all the gunk out of your pores. You can see a huge difference after using it! Blackheads are banished and my skin looks flawless. This is definitely my go to mask that I use the most.